Wahl Professional Animal's Bravura Lithium Pet Clipper combines the power and durability of lithium ion battery innovation with Wahl's adjustable 5-in-1 blade to give groomers, animal professionals, and pet owners everything needed in a lightweight cordless clipper. The five blades adjust to sizes #9, #10, #15, #30, and #40, offering great variety in your cuts. The Bravura's rechargeable lithium ion battery has a 90-minute cordless run time and will operate at full power until the battery is completely depleted. Recharge the battery in 60 minutes or simply plug in the cord and continue to clip your pet. Ergonomically designed to fit comfortably in your hand, the Bravura is lightweight--weighing only 8.8 ounces--to prevent wrist fatigue while the grip surface provides control without sacrificing comfort. A powerful 5,500 strokes per minute speed ensures an efficient trim for your animal. Combines the power and durability of lithium ion battery innovation with Wahl's adjustable 5-in-1 blade to give groomers, animal professionals, and pet owners everything needed in a lightweight cordless clipper. The 5-in-1 blade adjusts between sizes #9, 10, 15, 30, and 40, offering a convenient variety of cutting lengths. The rechargeable lithium ion battery has a 90-minute cordless run time of cool running, low vibration, and quiet operation. The clipper will operate at full power until the battery is completely depleted; recharge the battery in 60 minutes or simply plug in the cord and continue to clip your pet. Ideal for the feet, face, and all finish work on all dog breeds, light body clipping on small- and medium-sized dogs, and cat grooming. The Bravura can also be used for trimming horse's bridle path, ears, muzzle, and fetlocks as well as trimming show cuts for goats, pigs, and cattle. 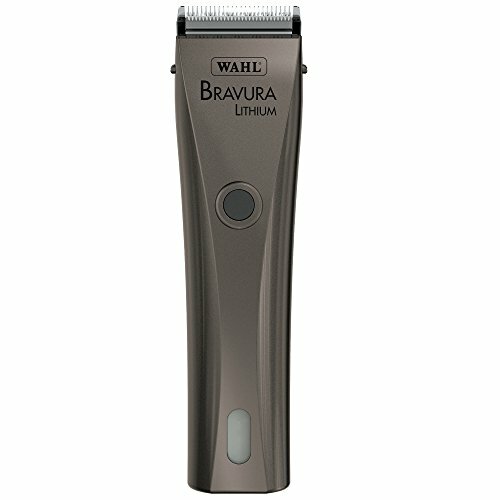 Measures 7 inches long, weighs 8.8 ounces and includes Wahl's one-year limited professional warranty. The Bravura clipper is made in Hungary; the blades are made in Germany.